Both concepts are shown as a percentage of your equity. While your Equity at Risk is a percentage calculated automatically depending on the investments you have made, your Maximum Risk depends on you and you can modify it any time you need to. What Exactly is Max. Risk? Your Max. Risk (or Risk Tolerance) is the amount of money you could bear to lose in a month without feeling tempted to sell. The probability that you’ll lose more than this in any one month is 5%. To put it differently, you can lose more than this amount in 1 out of every 20 months. In the other 19 months out of 20, you probably won’t lose more than the amount you set as your Maximum Risk. Note that this is not a 100% guarantee, but a statistical probability. Your Risk Tolerance is related to your potential profits in the sense that the more you risk, the more you can gain. A higher Risk Tolerance means higher possible losses but also higher potential profits. A lower Risk Tolerance means lower possible losses but also lower potential profits. 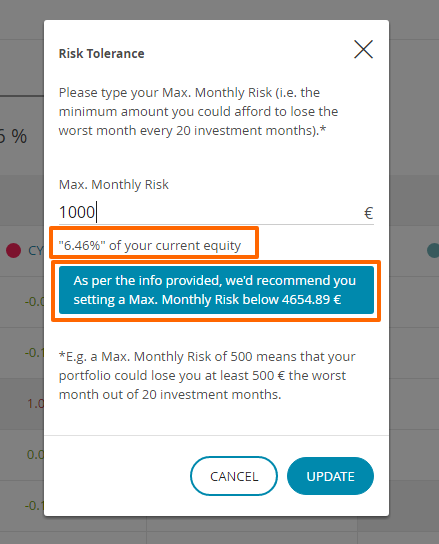 After indicating the amount you are ready to risk monthly, we calculate your Maximum Risk in terms of a percentage of your equity. You are also given a recommendation for Maximum Risk based on the information about your knowledge and savings you introduced under the 'Solvency' section of your profile. That’s why it’s important that the data you introduce reflects you real situation. Should your financial profile change, please inform us so we can update this data and give you a new recommendation based on your new profile. If a new investment makes you exceed your Maximum Risk, you’ll be technically prevented to make that investment, that is, you won’t be allowed to buy more DARWINs unless you sell some first (or increase your Maximum Risk). Maximum risk is NOT a stop loss. If your open investments's P&L surpasses your maximum risk, you investments will not get closed automatically. If DARWINs have a stable risk target of 10% monthly value at risk (VaR), how can I, as an investor, take less risk than 10% monthly VaR? The answer is: diversification. The more you diversify your portfolio among different DARWINs, the less the risk of your portfolio as a whole. However, in order to benefit from diversification, the DARWINs you invest in mustn’t be too correlated. In the correlation table all the number ones in red mean that strategies are exactly the same - which they are. When strategies are not exactly the same they have a correlation lower than 1 but they still can have more or less similar returns. A correlation higher than 0.7 means that the DARWINs' return curve moves very similarly. The lower the correlation between the DARWINs of your portfolio, the higher your diversification benefit. Correlation between DARWINs is recalculated every day so your diversification benefit changes every day as well. And when your diversification benefit changes, your equity at risk also changes. That’s why we recommend checking the correlation table every now and then. We also recommend checking correlation before investing in a new DARWIN. You can do this on the DARWIN’s page, under the correlation tab. For example, in the case of PLF, you can see a very high correlation with LZL. Should you have LZL already in your portfolio, buying PLF would reduce your diversification benefit. In this example you can see that LZL is a DARWIN of the same trader who also offers PLF, however this doesn’t need to be always the case. Two DARWINs can be highly correlated even if they are of different traders.